Complete support during every project phase. We support our customers in the ever fiercer competition with the quality of our products and services. We measure our achievements against the success of our customers and their satisfaction. This attitude and motivation has turned us into the global leader in our industry. Today and in the future we are developing the best solutions for our customers - highly committed and technically state-of-the-art. 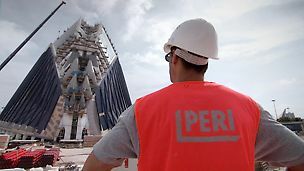 Our professional support by dedicated supervisors ensures efficient use of PERI materials from the outset and throughout the project. In close cooperation with the project site managers, we optimise material requirements and use. 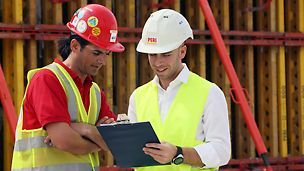 As a formwork and scaffolding supplier, PERI pays particular attention to health and safety for all those working on construction sites. With the support of our PERI Site Supervisors and Sales Engineers, PERI made a presentation showing construction safety guidelines for using PERI material in the most optimised and secure way. It was presented in different languanges using graphs and visuals to reach a larger audience and deliver the message in a clear and interactive manner. With the extreme weather conditions that workers are facing every day, it is important to raise awareness on the damages of heat stress and dehydration risks which can lead to dangerous outcomes. PERI shed light on those dangers by organising a tour around jobsites in the UAE and Oman distributing metal water bottles to participants. These bottles are a particular tool for staying alert and having easy access to water at all times. They can be attached to the waist and carried around the jobsite. They are easily refilled and re-used.